First-year Lauren Sotnyk hits a line drive toward first base. 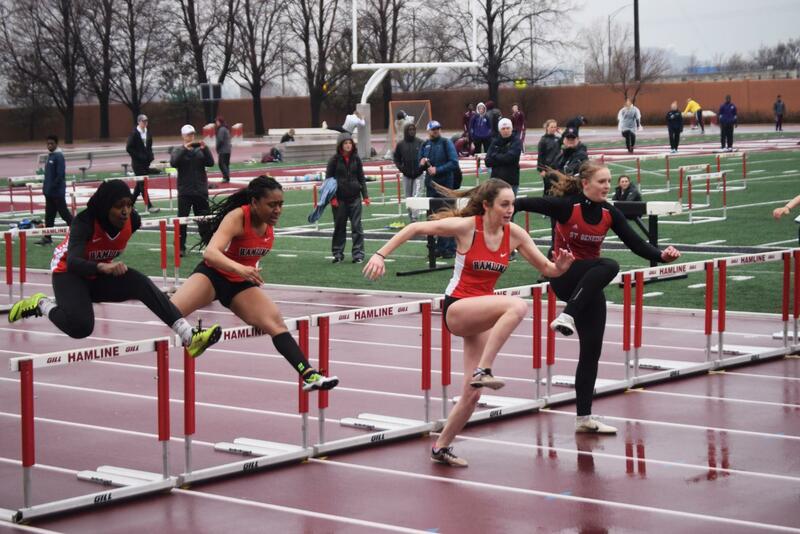 Hamline had the opportunity to host a meet April 6. The invitational saw competition from D-III, D-II and D-I schools. The wide variety of competitors did not slow down Hamline senior Madeline Dopp, who won the 3000 meter Steeplechase with a time of 11:36.58. This outstanding time beat the past MIAC record this season by twelve seconds. Alongside Dopp was sophomore Nyjah Willis who took home first in the Hammer with a 166-3 throw. Junior Jessie Juenemann won the discus with a throw of 148-11. Senior Gabrielle Brown and junior Abigail Van Goethem both took third in their respective events. Sophomore Helen Dolan and junior Savanna Keiser found their way into fourth place. 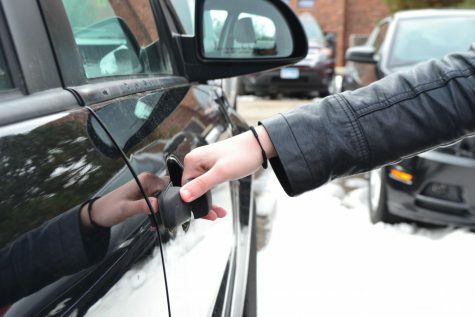 Rounding out all of Hamline’s top five efforts was junior Briana Berninghaus. Women’s Track & Field athletes compete in a meet on April 6. Pictured from left are first-year Muna Abrahim, junior Mellissa Clarke and junior Briana Berninghaus. The men’s Track and Field team had the opportunity to compete with home field advantage last Saturday April 6. The HU invite gathered a wide range of competition from all sorts of different schools. The Hamline team did not get fazed by the new competitors. Senior Eric Dols continued his strong season with a win in the Hammer from a 187-2 throw, as well as second in the Shot put. First-year Christian Velishek had a high flying performance winning high jump with a 6-6.76 height, the best this MIAC season. Velishek also took third in the Long Jump with a distance of 20-11.25. Senior Jay Hendrycks won the javelin with a throw of 172-8. Junior Frank Gustafson took second in the 1500 meters and senior Dylan Olson took fourth in the 110 hurdles. 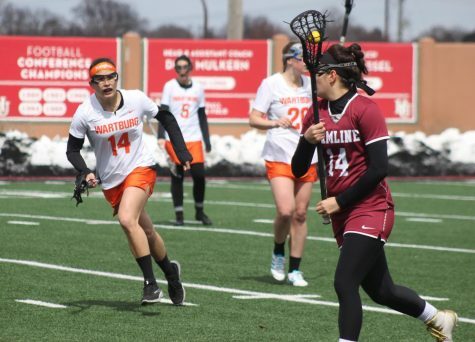 The Women’s Lacrosse team is over halfway through their season as of April 6. After 9 games, the team remains undefeated. Their game against Illinois Tech saw the team travel all the way to Chicago. The game started with an early score from Hamline, followed a few minutes later by Illinois Tech tying it up 1-1. This didn’t last long as Hamline scored two times in a row before Illinois Tech got another point. The first half continued this way ending the first period 9-4. The second period saw Illinois Tech score early, with a response from Hamline coming in under a minute. The two went back and forth through the second period ending the game 15-8. The lacrosse team’s next home game is against Northwestern at Klas Field on April 10 at 7:00 PM. This will be the first of five home games that the team will play at Klas. 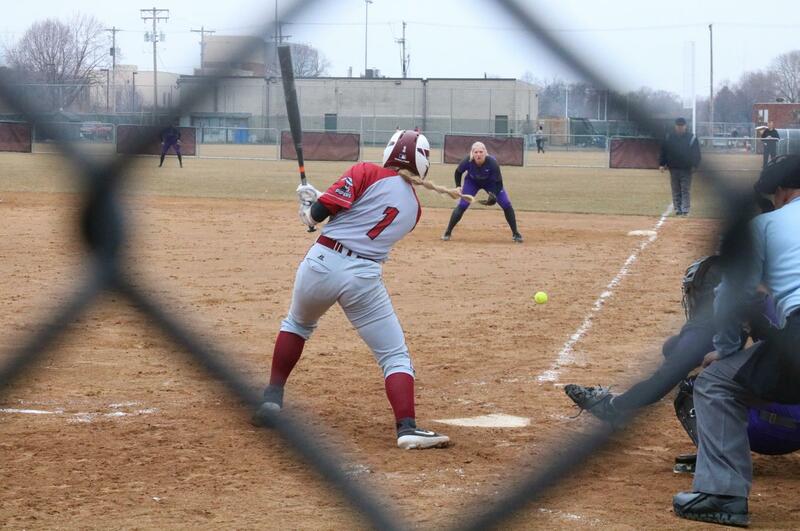 Hamline played back to back games against St. Mary’s on Saturday April 6. The team was looking to bring their MIAC record above a .500, they would have to win both games in order to do so. Hamline took the first game with ease, scoring in the first, third, fourth and seventh innings without a response from St. Mary’s. This ended the first game 5-0. Up by one game Hamline was now looking to sweep. The second game started fast. Hamline scored three point in the top of the first, yet this time St. Mary’s came back swinging, scoring two points, keeping the game close. During third inning Hamline scored another three points to grant themselves a commanding lead. St. Mary’s did manage another point before the end of the game yet it was too little too late. 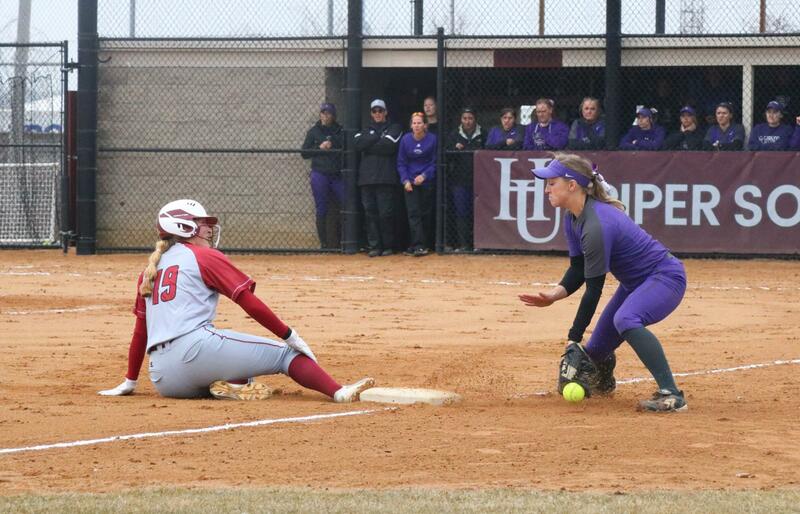 Hamline took home their second win with a score of 6-3. The team now stands at a record of 4-3 in the MIAC and 11-12 overall. Their next home game will be April 13 against Concordia on Meredith Field. First-year Theresa Klinnert slides to safety during the game against St. Mary’s. The Women’s Tennis team were back in Baseline Tennis Center to take on Macalester on April 6. The singles competition saw sophomore Ali Kopiecki, first-year Courtney Fenech and junior Megan Anderson all sweeping their matches. The team would only need to win two of the doubles matches to take the win. These wins came from the duos Fenech and her teammate senior Natalie Pieterick, as well as the Anderson-Kopiecki duo. These wins gave Hamline their first wins in the MIAC this season, the look to play Concordia on April 14. With a dominant winning streak Hamline junior, and athlete of the week, Jake Trondson was able to continue to eight wins. His win, combined with a win in singles from first-year Elias Ramirez, had the team at 2-3. In doubles Trondson teamed up with first-year Tou Ger Xiong, for a third win in the night. Unfortunately the three wins were not enough to take the win that day, and the team dropped to a record of 7-9. Hamline has three more games left in their season, including a home game against Concordia on April 14.